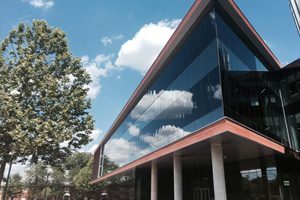 Students and faculty working in Bowie State University’s new Center for Natural Sciences, Mathematics and Nursing spend their days in sunny, glass-walled labs and flexible classrooms with movable walls and furnishings that support interactive, collaborative learning. Constructing this fresh learning environment took two years and intense coordination among all the building trades, who utilized CAD layouts and BIM modeling. Electrical Alliance contractor, PerLectric installed all of the electrical systems—everything from standard office buildouts to much more complex individual lab lighting systems, greenhouse systems and simulated hospital bed panels. Within the Center’s walls thousands of students will train for new careers in a variety of industries. Therefore, the building design contains an array of diverse and important features. The building’s three-story atrium in the center of the building is a gorgeous finished product. The atrium’s height, and the fact that it cuts the building in half, however, added complexity to PerLectric’s work. The location of the work required the team to work on scaffolding and lifts to connect both sides of the building’s wiring. 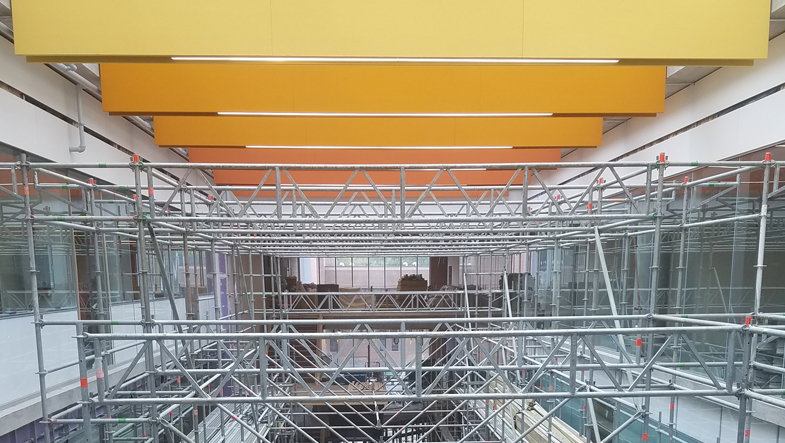 “Getting all of the wiring around the atrium was a challenge that added to the level of coordination required,” said Pinto. Known as the Icon, this oval-shaped, three-level auditorium seats 100-150 people. PerLectric installed lighting fixtures that hang down from the ceiling in a tiered fashion. “In some cases, the fixtures hung down a few floors,” explained Pinto. The two-level greenhouse was another unique part of this project, involving a high-level of craftsmanship. Electrical systems control the irrigation and carbon dioxide systems, windows and fans. Motors controlling the operation of the greenhouse’s windows are located outside the building and are programmed to open or close depending on outside air temperature. Adding to the challenge, PerLectric installed all of the electric systems within a stainless steel, rust-resistant environment. Another feature of this building is the nursing simulation wing where students gain the skills required to care for patients. In this area, PerLectric installed a fully functioning headboard system, such as you find in a hospital emergency room. A major element of the project was the electrical work that went into the buildout of the elaborate science labs. Each lab has its own stand-alone lighting control system as well as its own air handler units, all of which co-ordinate with each other in order to maximize syncronization and energy efficiency. Again, the team was faced with 20-foot ceilings which required that work be done on lifts and ladders. The building contains a full 25,000 square feet of dynamic glazed windows that tint on-demand to lower energy usage and provide unobstructed views and natural daylight. To achieve this, all of the windows were wired and connected electrically to tint at certain times of day to reduce the amount of UV rays entering the building. All of these features require a lot of electrical power and again, PerLectric underwent extensive coordination to put the appropriate electrical systems and emergency back-up systems in place. All in all, the project took in excess of 30 electricians on the job at any given point. Deadlines were tight and the PerLectric team worked within them to keep up with the concrete pour schedules. “The nature of how the job had to get built meant a lot of challenging timeframes had to be met, and I’m proud of how our PerLectric team was able to work within them to complete this very complex job,” noted Pinto.